A group of my small 5" x 5" drawings will be shown in a group show at the Metro Gallery in Baltimore, MD. I will have three pieces on view at the Circle Gallery in Annapolis, MD. I have 5 drawings from my Are We Home Yet? series (that I showed at my thesis show) up in the gallery at CCBC Essex. They are part of a group exhibition titled Charm City Scapes. The show is up until Saturday, December 2nd. Opening reception Friday, December 1st! The Gallery is located in the Arts and Humanities building! My artwork is currently being shown in the P.L.U.M. Gallery in St. Augustine, Fl. 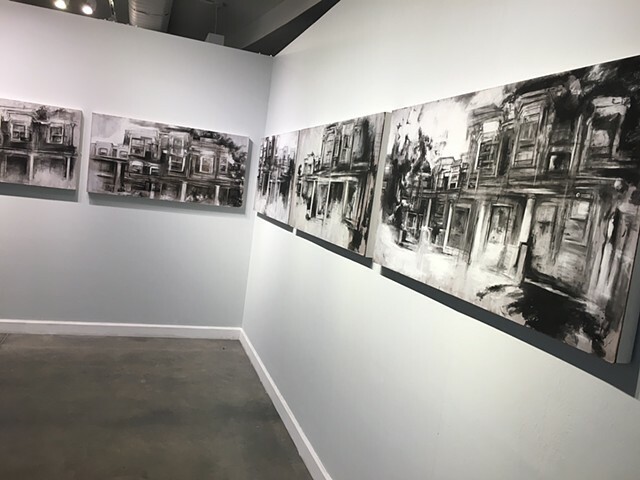 The gallery is located at 9 Aviles Street. I have two large charcoal drawings as well as a smaller one and some tiny Pencil Drawings. They will be up until the end of June. There are also two more show openings for this exhibit, the artwalks for May and June, specifically May 6th and June 3rd! My Charcoal Drawing are officially installed in Cellar Six Restaurant. They will be up from April 12th until June 30th. Stop by and take a look! "Canterbury Cathedral" has been moved to Cellar Six to make room for the new drawing "Westminster Abbey" in the P.L.U.M. Gallery!